But he turned the corner and now Vassily Kostiuchenko is one of the most promising Belarusian artists. 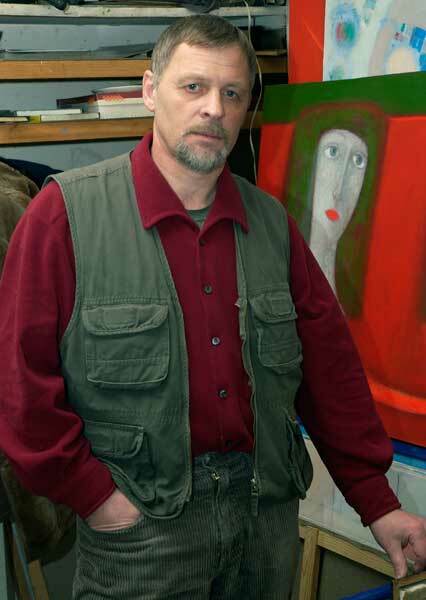 His works were auctioned at Christie’s and in 2006 he became a laureate of President of Belarus award in visual arts. Vassily Kostiuchenko is one of a few modern Belarusian artists who mastered the fundamental property of color – energy. The active spots of red, green, yellow and white colors on his canvases pulsate and transmit emotional heat. Vassily enjoys using unusual colors in his works. Each of them is selected to go in tune with a certain topic depicted in his painting. He thoroughly draws every detail and even at times highlights them with a needle. “A painting, just like a music composition, shouldn’t contain a single false note … shade – to be exact” says the artist. His warm and almost tender in color works enrapture the audience. In his paintings different objects and people keep in tune with corresponding art tonality. The color on his canvases either subsides and softens or, as if suddenly exploding, spills out and spreads out. Vassily Kostiuchenko’s acute and poetic perception of the beauty of the surrounding world and his visualization through colors of deeply personal emotions and feelings makes the core essence of his works. 1976 started participated in various state exhibitions. 2006 became a laureate of the President of Belarus Award in Fine Arts. Vassily Kostiuchenko’s works are at the National Art Museum (Minsk, Belarus), the Museum of Modern Art (Minsk, Belarus) and private collections in Russia, Germany, Sweden, Italy, Poland and France.